After being picked up from your Tokyo hotel, enjoy a scenic guided tour of central Tokyo’s ancient and modern attractions. Your guided tour by air-conditioned coach takes in the Imperial Palace Plaza with its palace and landscaped grounds, the art-deco National Diet Building and the palatial State Guest House. You’ll also see the shops and neon-lit towers of the Ginza and Akihabara districts, before arriving in the temple quarter of Asakusa. 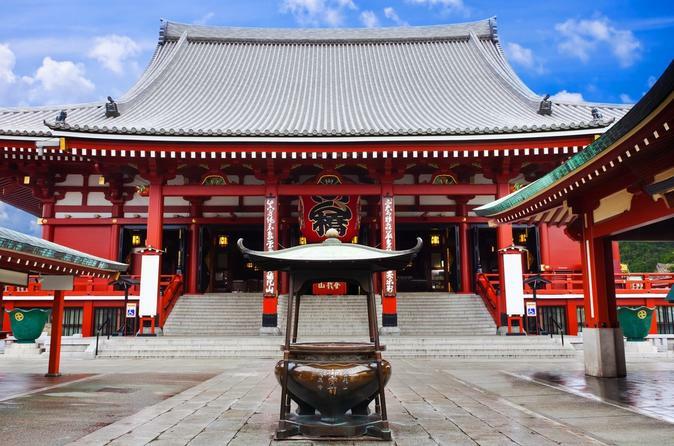 The highlight of your visit to Asakusa is Senso-ji, Tokyo’s oldest Buddhist temple. In addition to admiring the temple’s five-story pagoda, imposing Thunder Gate and distinctive temple architecture, you’ll have the opportunity to browse the avenue of outdoor food stalls and souvenir shops leading up to the temple. Your tour continues to the Sumida district to visit one of Tokyo’s newest attractions, the Tokyo Skytree, which opened in May 2012 and is the world’s tallest tower at a total height of 2,080 feet (634 meters). From the heady heights of the Skytree’s Tembo Deck, at 1,148 feet (350 meters), you can enjoy stunning panoramic views of Tokyo stretching to the horizon on every side. To complement the views, you’ll also find a cafe, restaurant and shop on this level. If you then wish to go higher, you may do so by purchasing an extension of your ticket directly at the ticket counter located on the Tokyo Skytree Tembo Deck. Then climb up to the Skytree Tembo Galleria on the upper observatory deck for a breathtaking view from 1,476 feet (450 meters). The tour ends at Tokyo Station, conveniently located near the Imperial Palace grounds and Ginza commercial district.